But we keep using it anyway. If you want to know whether you may be overweight, you’ve likely confronted your BMI, or body mass index, to see where you fall on the spectrum of “underweight” to “obese.” The BMI, created in the 1800s by Belgian mathematician Adolphe Quetelet and adopted during the late 20th century, has become the way governments, drug manufacturers, physicians and us would-be dieters measure obesity, or the lack thereof. But BMI can go wrong. It can incorrectly flag the athletic or particularly muscular as overweight, for one. And a growing pile of research shows that it misses another category of people: those who are carrying a few extra pounds or who are even normal weight according to their BMI but who have too much fat in a particularly dangerous place. It’s those people who may walk around thinking they’re perfectly healthy when instead they’re at higher risk of heart disease, diabetes and premature death. There are other metrics that do a much better job of identifying these people — all we have to do is measure some hips and waists. Taken alone as an indicator of health, the BMI is misleading. A study by researchers at UCLA published this month in the International Journal of Obesity looked at 40,420 adults in the most recent U.S. National Health and Nutrition Examination Survey and assessed their health as measured by six accepted metrics, including blood pressure, cholesterol and C-reactive protein (a gauge of inflammation). It found that 47 percent of people classified as overweight by BMI and 29 percent of those who qualified as obese were healthy as measured by at least five of those other metrics. Meanwhile, 31 percent of normal-weight people were unhealthy by two or more of the same measures.2 Using BMI alone as a measure of health would misclassify almost 75 million adults in the U.S., the authors concluded. Lopez-Jimenez said that rather than relying solely on BMI to gauge obesity, we should be looking specifically for excess fat and whether it’s disproportionately lodged around the midsection, since both factors are associated with poorer health outcomes. He and others are studying metrics that incorporate waist size, which is known to be an indicator of visceral fat. That’s the particularly dangerous type of fat that sits deep within the torso, surrounding the organs. An Australian study published this month evaluated mortality risk by both BMI and one of these waist-oriented measures. The research, which was released in the journal Obesity, looked at 41,439 adults and classified them both by BMI and waist circumference, measured at the narrowest part of the torso. (There are different techniques for measuring the waist.) Men counted as obese if they had a waistline of 40 inches or more, women if theirs was 35 inches or more. “Obviously, the people who were big by both measures had an increased risk of mortality,” about 30 percent higher than those who weren’t obese by either measure, said Stephanie Tanamas, an author of the study who is now a research fellow with the U.S. National Institutes of Health. But those with a big belly and a non-obese BMI were also at risk; they had about a 20 percent higher risk of death than those who weren’t obese by either BMI or their waistline measurements. The researchers analyzed the health data for 15,184 adults who were part of the National Health and Nutrition Examination Survey. 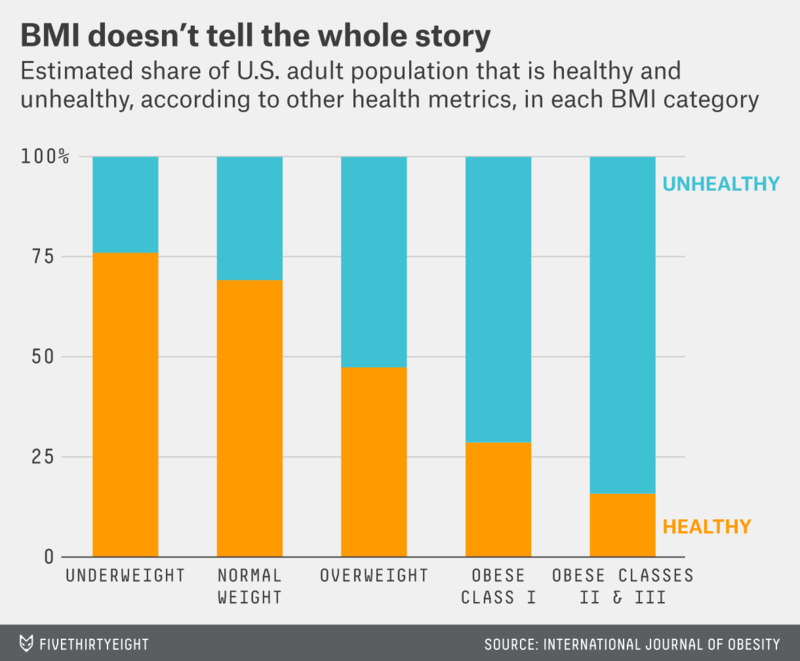 Their results, published in the Annals of Internal Medicine, were pretty surprising: They showed that midsection obesity was a killer, even among people with normal BMIs. For example, a man with a BMI of 22 (putting him firmly in the normal range) but too much belly fat according to his waist-to-hip ratio had an 87 percent higher mortality risk than a guy with the same BMI and a healthy waist-to-hip ratio. The BMI persists because of inertia — it’s what everyone’s used to dealing with — and simplicity. “Everyone can measure height and weight,” Tanamas said. Waist circumference is pretty straightforward but must be done the same way every time to see a trend in an individual. (It’s not enough to just use your pants size, men, because labels are often misleading.) The waist-to-hip ratio adds another measurement into the mix, increasing the complexity, and the hip can be hard to find, said Paul Poirier, a cardiologist at Laval University in Quebec City. He and Lopez-Jimenez both said that although the BMI is not the best metric, it’s ingrained enough as a crude screening tool that it’s not likely to go away anytime soon. But at the very least, they said, waist-based indicators should be used in tandem with BMI to identify more people who are at risk. There’s another camp that doesn’t care about finding a better measure of excess body fat at all but would prefer to move beyond metrics of extra fat. “Sure, waist circumference is better than BMI, but the focus on fat and on body size has done us a disservice,” said A. Janet Tomiyama, a psychologist at UCLA and first author of the recent International Journal of Obesity study on BMI and health indicators. “It’s thrown off the focus on actual health markers.” And, she said, it has contributed to a stigma against the overweight. She’d prefer to see a strategy that focuses instead on changing behavior. “If you’re eating healthy, exercising and sleeping well, I don’t care how much fat you have,” Tomiyama said. Given those results, the authors say it’s unfair for the U.S. Equal Employment Opportunity Commission to permit employers to charge employees with lower BMIs less for health insurance, as the commission has proposed. Different public health recommendations have different — and arbitrary — cutoffs in the range of 0.8-0.85 for women and 0.9-1.0 for men.